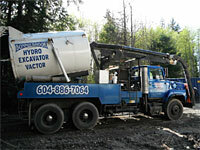 Bonniebrook Industries Ltd. is a septic service company established in 1977 to provide complete septic services for the entire Sunshine Coast. In recent years Bonniebrook Industries has grown and diversified in order to provide service to island and lake communities, industrial washing, snow plowing and salting, street sweeping, perimeter drain installation and maintenance, dust control, fire suppression, and pump sales and service. The primary goal of Bonniebrook Industries Ltd. is to provide the services required to enhance and maintain community health on the Sunshine Coast by way of effective and timely waste and wastewater management while also sustaining business practices that will cultivate goodwill and contribute, on the whole, to the well being of the community of which we are a part. Bonniebrook Industries Ltd. derives its excellent service record from the dedication, work ethic, and wide range of experience of its crew. We pride ourselves on our ability and willingness to provide professional service whenever it may be required. Waiting until there is a problem with your septic system is not the way to go. The consequences of this can be very expensive. Call or email us today to schedule a maintenance visit. This page printed from http://www.bonniebrookindustries.ca © 2014 Bonniebrook Industries Ltd., Gibsons, BC, Canada. Site by Attention Web & Graphic Design.